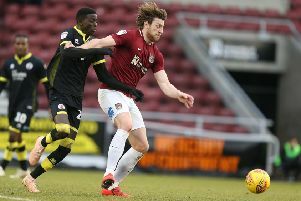 A proud Aaron Pierre says he is ‘loving’ his new role as captain of the Cobblers and believes the extra responsibility has only enhanced his performances on the pitch. The imposing centre-back, initially handed the armband against Carlisle United last month, skippered Town for the sixth successive game on Saturday when he also scored in a 1-1 draw with Lincoln City at Sincil Bank. David Buchanan and Ash Taylor had previously shared captain duties this season but manager Keith Curle revealed on Saturday that he felt handing the responsibility to Pierre would help him become more of a ‘leader’ while also improving his performances on the pitch. And the 25-year-old echoed those views when asked about his new role in the wake of Saturday’s draw. “I love it,” he said. “I think it’s everyone’s dream to be a captain at some stage of their career and I’m fortunate enough to get it here. Curle is encouraging as many of his players as possible to become ‘leaders’ on the pitch, whether they are wearing the armband or not. For me, it’s more about encouraging people and making sure things are done properly. “It’s about being a leader,” Pierre agreed. “Everyone was a leader at Lincoln, everyone showed leadership and everyone showed determination but, for me, it’s more about encouraging people and making sure things are done properly.